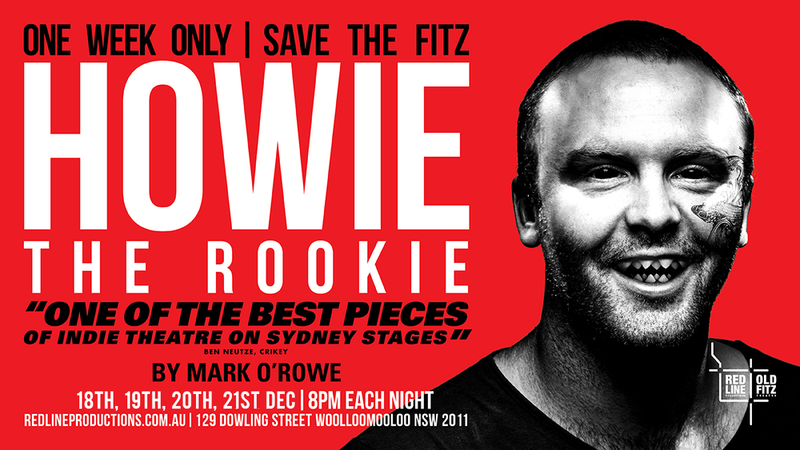 After being denied funding for our 2019 Season: UNLEASHED and receiving an incredible outpouring of support from our community as a result, Red Line Productions are taking it back to where it all began five years ago with a special week of our first ever production of Mark O’Rowe’s HOWIE THE ROOKIE to raise the final funds required to keep the Old Fitz Theatre alive and thriving. Performed by Artistic Director, Andrew Henry, and directed by Toby Schmitz, this will be last time Red Line Productions’ production of this play will ever be performed in Australia. Andrew Henry is an alumni from the School at Steppenwolf in Chicago. Theatre credits include Treat in Lyle Kessler's Orphans directed by Anthony Gooley, The Howie Lee in Howie The Rookie by Mark O'Rowe directed by Toby Schmitz which earned Andrew a Sydney Theatre Award for Best Actor in an independent production; C.S Lewis in Freuds Last Session at QPAC directed by Adam Cook, Douglas in Europe by Michael Gow, Andrew was nominated for a Sydney Theatre award for best supporting actor in an independent production for his role as Chris Keller in All My Sons by Arthur Miller at the Eternity Playhouse directed by Iain Sinclair and he won the Glug Award for this performance. Other theatre credits include Victor Frankenstein in Nick Dears adaptation of Frankenstein which toured nationally and was directed by Mark Kilmurry, the Australian premiere of Reasons to be Pretty by Neil Labute directed by James Beach, The Schelling Point directed by Sarah Goodes and The Chronic-ills of Robert Zimmerman aka Bob Dylan directed by Lucinda Gleeson. Toby Schmitz is a writer, director and actor. His theatre acting credits include The Present, Hamlet, The Rover, The Wild Duck, Thyestes, Strange Interlude, Private Lives, Measure for Measure, Ruben Guthrie, Rosencrantz and Guildenstern are Dead, Travesties, The Importance of Being Earnest, Much Ado About Nothing, The School for Scandal and Nowra’s Boyce Trilogy. His plays include Capture The Flag, I Want To Sleep With Tom Stoppard, Degenerate Art, and Chicks Will Dig You! for which he won the Patrick White Award. His directing credits include Boy’s Life, This Is How It Goes, Shakespearealism, Howie the Rookie and Degenerate Art.